The end of a marriage after the death of a child, the tale of Jesus’ childhood and the island journey of a woman who must take a life changing decision are three fragments of a story that tugs directly on the heartstrings, showing us that love will always find a way. Niños en el tiempo is a novel about love in all its amazing and catastrophic dimensions, but it also explores the capacity of literature to overcome grief and bring back not the people we have lost, but our true selves, rescuing our dignity and sanity when it seemed as though there was no hope left. Ricardo Menéndez Salmón brings us one of his most stunning works, an affirmation of life infused with both epic and intimate dimensions in a surprising structure that reveals a profound truth: art is the only human activity to teach us that life is more important than art itself. A story that tugs directly on the heartstrings about the incredible fact that life will always find a way. The new novel by Ricardo Menéndez Salmón is his most luminous, surprising, optimistic and accessible work yet. A story about love – love for a child, for a wife, love for ourselves – with a hidden surprise. 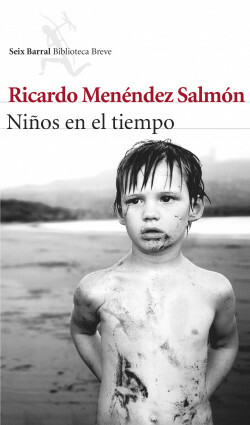 Ricardo Menéndez Salmón is, without a doubt, one of the most respected and critically acclaimed authors writing today. He has received dozens of literary prizes and has a well-established literary reputation and his books have been published to great critical acclaim throughout Europe. Marcos & Marcos (Italy), Jacqueline Chambon (France). Wagenbach (Germany), Wereldbibliotheek (The Netherlands), Porto Editora (Portugal), Ithaki (Turkey).